Below are a few photos to guide you through the pie-making process. At the very bottom of this post, you’ll find the recipe. 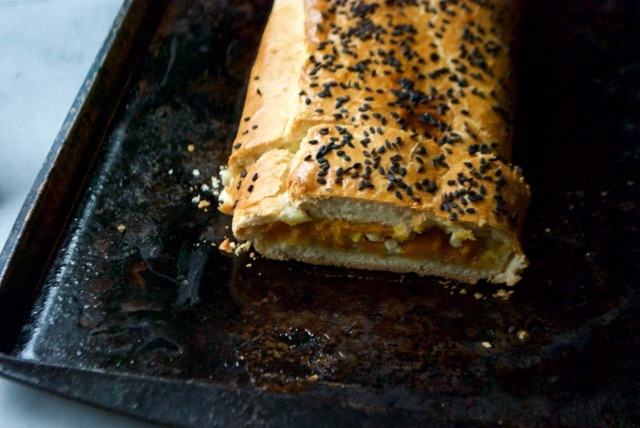 You’ll roll it into a long rectangle, and fill it with the carrot-onion-egg mixture. 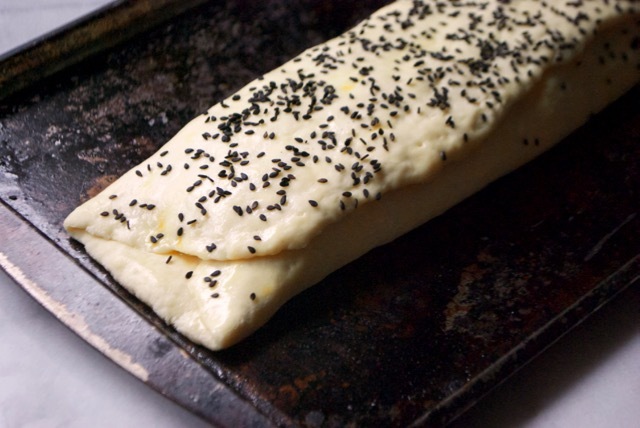 Here it is folded, brushed with egg, sprinkled with sesame seeds, and ready for the oven. A fully-baked, toasty golden brown pie. Estonian carrot pie with onions and boiled egg. 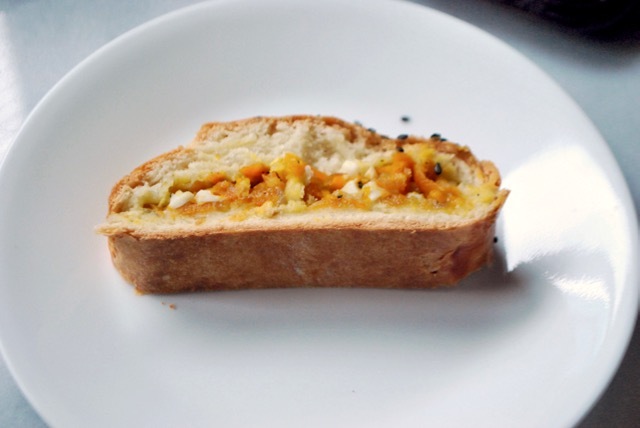 Makes 4 small servings, recipe doubles easily. Begin by making the dough. In a medium-sized bowl, whisk together the milk, salt, yeast, and sugar. Add in 3/4 cup flour, and mix until thoroughly combined. (Reserve the additional flour for later.) 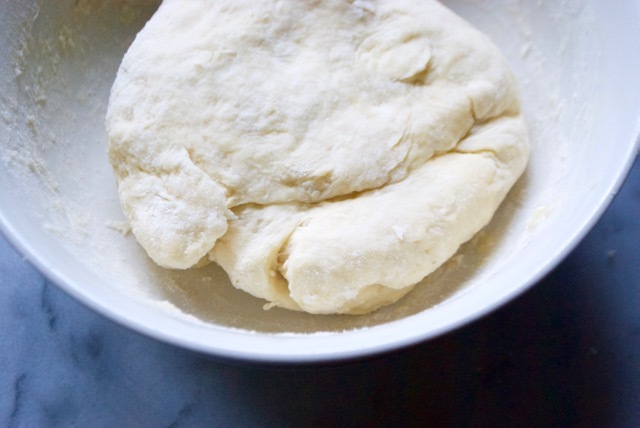 Set this dough base aside to rise for 15-20 minutes. 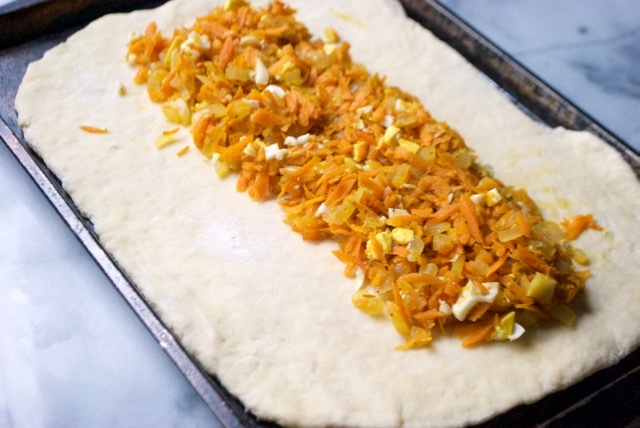 While the dough rises, make the carrot filling. Heat the oil in a large saucepan. Add the carrot and onion. Sauté for 5-10 minutes, until the carrots begin to soften, adding a water to the pan as needed to prevent browning. Remove from heat and stir in salt, pepper, nutmeg, and boiled egg. Continue to prepare the dough. Place 1/4 cup plus 2 tbsp all-purpose flour in a separate bowl. Cut in the 3 tbsp cold butter. Use fingertips to incorporate the butter into the flour. The mixture should look crumbly, and there should still be small chunks of butter in the flour mixture. Add the flour and butter mixture to the yeasted dough base. Fold the flour and butter in, then use your hands to knead it into a rough dough. Give the dough a few folds, adding an extra tablespoon or two of flour if needed. The dough should be mostly even, with some steaks of butter visible, and only slightly tacky to the touch. (Optional) Brush some beaten egg over the top of the pie. Sprinkle with sesame seeds for garnish. Bake at 350 F for 30 minutes, until the pastry is cooked through and browning on top. Cool slightly before serving. The dough for this pie is mixed in two parts, resulting in a slightly flakier crust. If you’d like to try a simpler preparation, and don’t mind a fluffier, breadier crust, you can simply melt the 3 tbsp of butter, and mix in the melted butter and full amount of flour in step #1. Knead the mixture together and continue with the recipe as written, skipping steps #3 and 4. 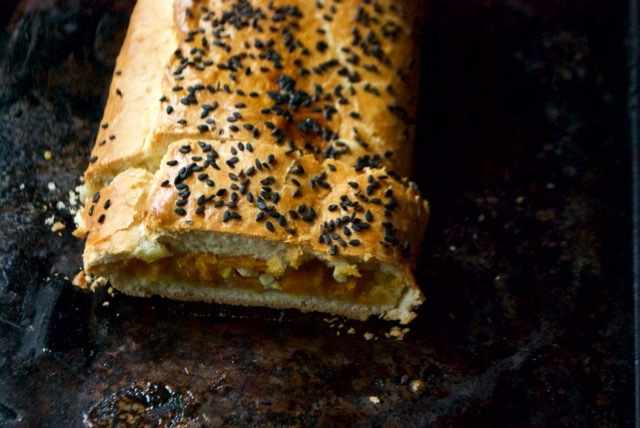 Alternatively, you can replace the dough with store bought puff pastry or frozen Danish dough. Adapted from nami-nami.ee and estonianfood.eu.